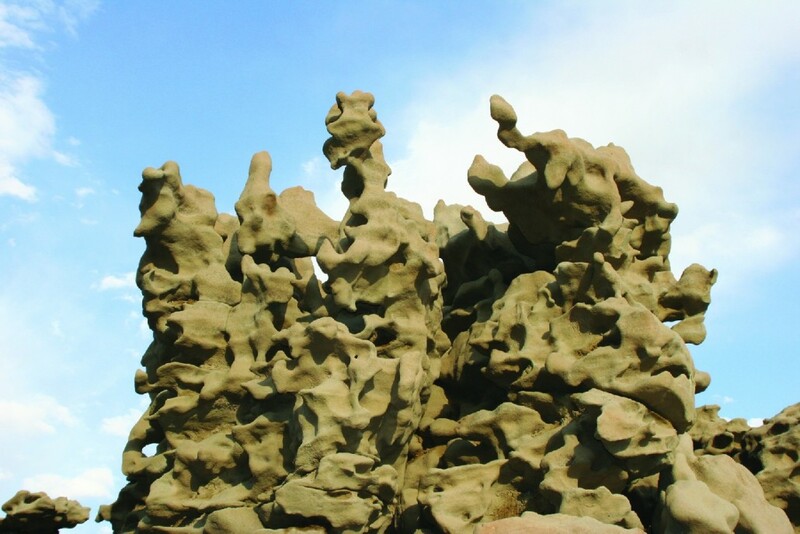 Fantasy Canyon is crowded with intricate and peculiar stone figures that are a unique expression of rock weathering and erosion. Covering only a few acres, this miniature canyon can be viewed up-close on a short 0.6-mile loop trail. The sandstone layer in which the pinnacles, pillars, arches, and knobs of Fantasy Canyon are formed consists of ancient river channel sediments. The underlying and overlying rock layers sandwiching the sandstone layer, and creating scenic badland topography around the canyon, are finer grained floodplain deposits. Rivers en route to the dwindling lake deposited sand, silt, and clay shed from nearby mountains. 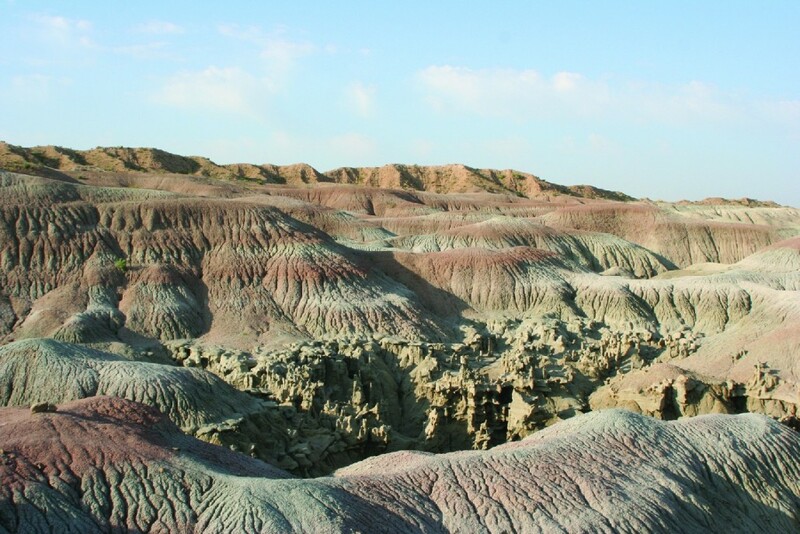 Once buried, these sediments eventually solidified into layers of sandstone, mudstone, and claystone. Collectively these rocks are a part of the Uinta Formation that spans extensive areas of the Uinta Basin and nearby Colorado. 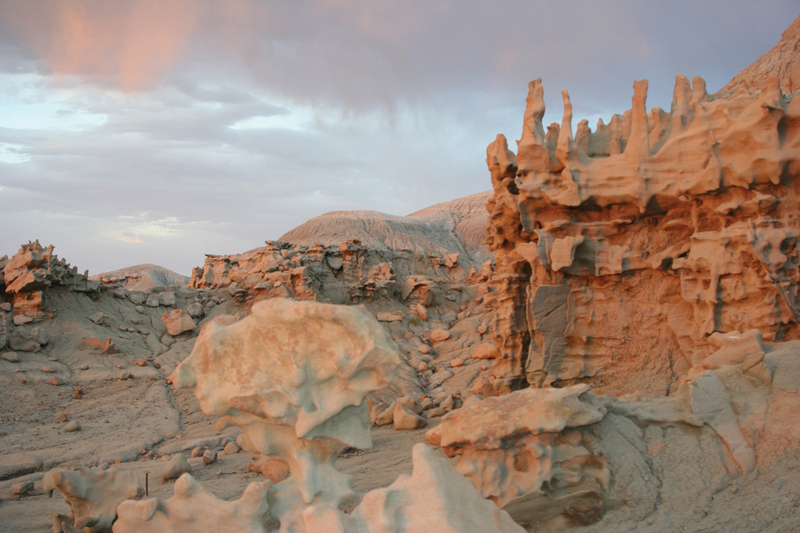 Differences in the rate of weathering and erosion between dissimilar rock types ultimately shaped Fantasy Canyon. The mudstone and claystone have been stripped away by water and wind, leaving the slightly more durable sandstone to be carved into bizarre, melted wax-like forms. 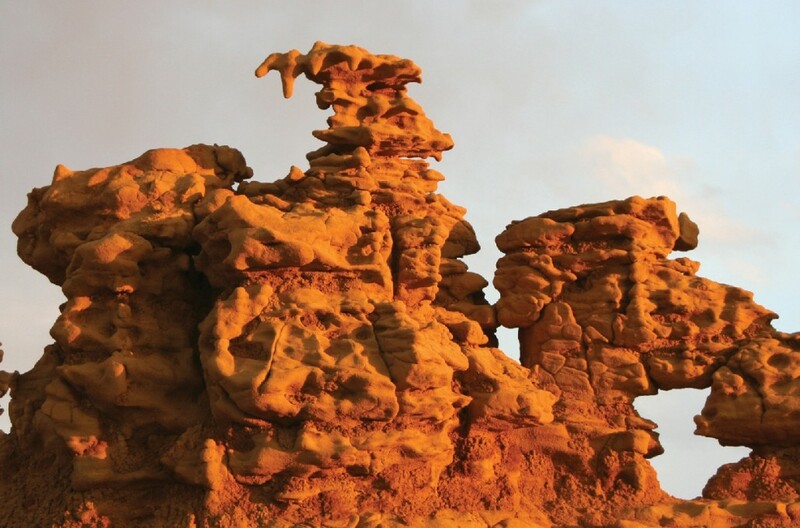 Although the sandstone is more resistant to erosion relative to adjacent rocks, it is in fact extremely fragile. The sandstone is fine grained, porous, soft, poorly cemented, brittle, and crumbly. When touched, grains of sand dislodge from the rock surface. This delicacy was underscored in September 2006 when “Teapot,” the centerpiece of Fantasy Canyon and the site’s most recognized and photographed stone figure, toppled from its base and shattered at the bottom of the canyon floor. The cause of Teapot’s fall remains a mystery. The Bureau of Land Management (BLM) administers Fantasy Canyon. We highly recommend visiting the Vernal BLM Field Office at 170 South 500 East, in Vernal (phone: 435-781-4400) for directions, maps, and other information. From Vernal take U.S. Route 40 until it curves southeast and then turn right (south) on Utah State Route 45. After crossing the Green River, travel about 13 miles, then turn right onto Glen Bench Road. The BLM signs for Fantasy Canyon begin here. Following these signs is the best way to prevent getting lost because this area is a confusing labyrinth of oil company service roads. Once on Glen Bench Road drive 0.3 miles and veer left, staying on the paved road. After about 13 miles take a left (southeast) onto an unpaved road (Watson Road – the road is unpaved in this direction and paved on the opposite, northwest side of the intersection). Go 2.4 miles and veer right, then 0.9 miles and take another right, then 0.5 miles – crossing Red Wash on the way – and turn left, and then after 0.6 miles take a right turn for the final tenth of a mile. Avoid going in rainy weather or if the dirt roads are wet because they are very slick, potholed, and cross washes. Also, this is a gas field buzzing with a high volume of truck traffic and the road is fairly rough, so please drive cautiously. The BLM alerts visitors to the presence of pygmy rattlesnakes, and in the summer season the canyon is hot and buggy. Red Wash SW 7.5’ topographic map, Vernal 30’x 60’ topographic map (BLM 2006 edition labels Fantasy Canyon, USGS 1980 edition does not label Fantasy Canyon). Topographic maps can be obtained from the Natural Resources Map & Bookstore, 1594 West North Temple, Salt Lake City, Utah, 84116 (801) 537-3320 or 1-888-UTAHMAP, mapstore.utah.gov.